As most of you know, I'm a history nut, so I'm especially pleased to welcome this week's guest. 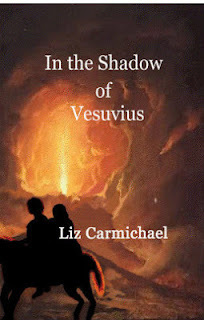 Liz Carmichael set her YA book In the Shadow of Vesuvius just as the great volcano is about to erupt and engulf the town of Herculaneum in the year 79 CE. She talks about her inspiration and research. Oh, and extra coolness this week: Liz is offering In the Shadow of Vesuvius free to everyone! Keep reading for your Smashwords code. Thank you, Anne, for this opportunity to write a guest post for your site. It’s a delight to do it. Most of what I read, and enjoy, is historical fiction. Favourite authors’ new releases make me jump for joy. My favourites: Vanora Bennett, Anne O’Brien, Sara Donati, Stef Penney, and Jane Harris, though I wish they went further back in time. It follows naturally that I write historical fiction, mostly. And that means research, and lots of it, which I love and often get carried away over. My biggest challenge with research is remembering I’m doing it for a story, not my entertainment. Of course I can never use all the discoveries I make or I’d be writing a history book. The other challenge is to have enough historical detail to enhance the reading pleasure, but not so much it detracts from the story I’m trying to tell. In the Shadow of Vesuvius was written after reading an article about a young slave who was uncovered during one of the archaeological digs at ancient Herculaneum. In her arms was a toddler wearing gold chains. The wear on the girl’s bones was what made archaeologists believe she was a slave - yet she clung to that Roman child. It affected me so much I had to write a story that gave them life. That is where In the Shadow of Vesuvius differs from other stories of the genre set in that period. Most others are written about well-known historical figures, and with Pompeii as the main setting. Probably because of the eye-witness account written by Pliny and added to by his nephew, which is also why Plinian eruptions are so called. Because the action takes place over the main forty-eight hour period around the 79CE Vesuvius eruption, I needed to understand the build-up to the eruption as well, and why Pompeii suffered from so much more ash and rock fall than Herculaneum. Surprisingly, a high wind saved Herculaneum from most of the ash and cinders but could not save it from the surges that buried the town. The first surge, which sent ahead super-heated gases that melted rocks and flesh in seconds, travelled the seven miles from Vesuvius to Herculaneum in under four minutes. Volcanology sites and the above mentioned records were a tremendous help to me when writing the story. Okay, I’ll stop there before the volcanology lesson gets too boring. I did say I could do research forever, didn’t I? Research on dress, food, homes, and lifestyle of Romans of the era, and how their slaves were treated was also necessary - some slaves were made to wear collars, others arm bracelets. Oh, oh. There I go, getting carried away again. Another difference with In the Shadow of Vesuvius is although originally meant for early teens it is equally enjoyed by adults. In the Shadow of Vesuvius is available in all e-formats on Smashwords. ONE WEEK ONLY: Use the code JP62F at Smashwords checkout to get the ebook for free until 6 Feb 2013. Also vailable for Kindle and in print at CreateSpace. Writing is a very personal activity, and we each do it in our own, idiosyncratic way. 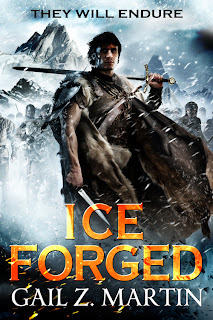 My guest this week is fantasy author Gail Z. Martin, whose newest book, Ice Forged: Book One in the Ascendant Kingdoms Saga (Orbit Books), launched in January 2013. Gail is also the author of the Chronicles of the Necromancer series (Solaris Books) and The Fallen Kings Cycle (Orbit Books). Here she offers some candid thoughts about how she writes. For more about Gail’s books and short stories, visit her website. She's on Twitter @GailZMartin. Read an excerpt from Ice Forged here. Purchase Ice Forged at Amazon, BN, and many other sites. Stacy Green is a writer fascinated by the workings of the criminal mind. She shares with us how she used elements of true crime and the dark truths of the city of Las Vegas to add layers of meaning and texture to her debut novel, Into the Dark. When I was five years old, a group of teenagers were drag racing down our road and ran into a light pole, plunging our house into darkness. I remember getting out of the bath just as everything went pitch black. I lost all senses. I couldn’t remember where I was or what I was doing. For a few brief seconds, I was so terrified I couldn’t move. I’m no longer afraid of the dark, but small, unlit rooms or places strike an immense fear in me. Maybe that’s why I was so drawn to the Las Vegas Tunnels. 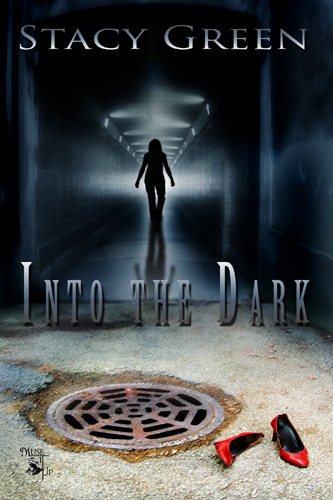 My debut novel, Into the Dark, features the homeless living in the storm drains beneath Las Vegas. Described as by journalists as “eerily quiet,” “pitch black,” and “heartbreaking,” the Las Vegas tunnels were a shock to this sheltered Midwestern girl. At any given time, more than 200 homeless take shelter from the heat in the drains, subjecting themselves to flash floods, filth, and danger. Many of them are addicts, some are criminals hiding from the police. All of them need a helping hand. The initial drafts of Into the Dark were about an embattled heroine falling for the handsome, all-star SWAT officer. Fun maybe, but without any real layers or deeper meaning. It wasn’t until I discovered the homeless in the drains below Vegas that Into the Dark’s characters became something more than one-dimensional creations. Emilie and Nathan only have a few scenes inside the drains, but putting them into the heartbreaking environment enabled me to get to the core of their characters. Having the bright lights of Las Vegas contrasting against the dark depths below the city, showcasing excess against squalor, is what makes Into the Dark about more than a SWAT officer trying to save the girl. Many have asked me if I’ve been in the tunnels, and the answer is no. This is where hours of research came in. I interviewed author Matt O’Brien, whose book Beneath The Neon brought the drains into the media spotlight. Matt and I talked at length about what it was really like walking through the dark maze, the smells, the bugs–the fear of what might be around the next corner. No matter how many times he’s explored the drains, that fear has never gone away. 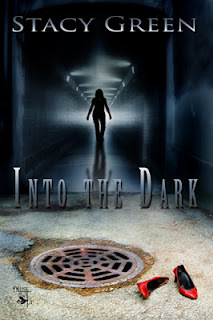 I’m not sure I’d ever have the guts to set foot in the drains, but I know that without the tunnels as a backdrop, Into the Dark wouldn’t be the same story. Because of that, I’m doing what I can to give back to the homeless through a charity raffle. Until February 28th, 2013, participants will have several options to enter the raffle, including donating to HELP of Southern Nevada. The grand prize will be a $100 donation from me in the winner’s name to the homeless shelter of their choice. Learn more about Stacy Green at her website and blog. Milo James Fowler writes short fiction. I mean short. No, even shorter than that. He's really good at it and has published a great deal. I asked him to discuss this skill for brevity. I used to be verbose. When I was a kid, I wrote 300-page novels and never felt the need to revise. I was having way too much fun for that. But revision is important. Cutting and polishing are very good things. So's a writing challenge every now and then. When I started Write1Sub1 in 2011 to follow in Ray Bradbury's footsteps (writing and submitting a story a week), I couldn't halt the ideas once I opened the floodgates. While I didn't have time to flesh them all out into full-length tales, some were so evocative that they stood well enough on their own, despite their brevity. Once I discovered microfiction and sci-fi/horror-flavored haiku, it was like the heavens opened and I saw into the glorious beyond. Microfiction—6 word stories, Twitter fiction, 6 sentence stories, drabbles—became a new creative outlet for me. I started jotting down mini-stories that could later become full-fledged tales of their own, and I brainstormed other ideas in a more poetic form through haiku. Then I sent them out into the world in search of good homes. Some of my favorite micro and haiku publications are Trapeze, Scifaikuest, Cuento, and 101 Ficton, and I've enjoyed sharing my byte-sized tales with their readers. What writer doesn't like being published? But I also appreciate the challenge—particularly with drabbles and haiku. 101 Fiction publishes 100-word stories with 1-word titles. Cramming a Captain Quasar tale into 100 words has been a lot of fun, and as far as haiku goes, I'm a stickler for the 5-7-5 syllable count—not because it really matters anymore in English language haiku, but because it provides me with a higher hurdle to cross. Next month, I'll be the featured poet in the winter issue of Scifaikuest with 11 of my haiku included in their print publication. I'm super stoked and can't wait to get my contributor's copy in the mail. Will all of my micro tales and haiku eventually become full-length stories of their own? "Identity Thief" started out as a haiku and became a short story available from Musa Publishing. "Grandpa's Bluetooth," published by Liquid Imagination, started out as Twitter fiction. Maybe the rest of my small packages will evolve in like manner; maybe not. I don't have to be verbose all the time, after all. But I can keep challenging myself to make every word count. You can learn more about Milo James Fowler on his website. 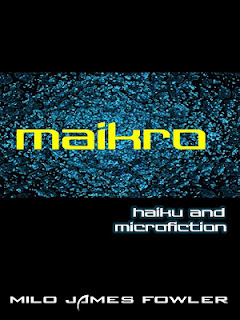 You can purchase Maikro, his collection of haiku and microfiction, on Amazon. 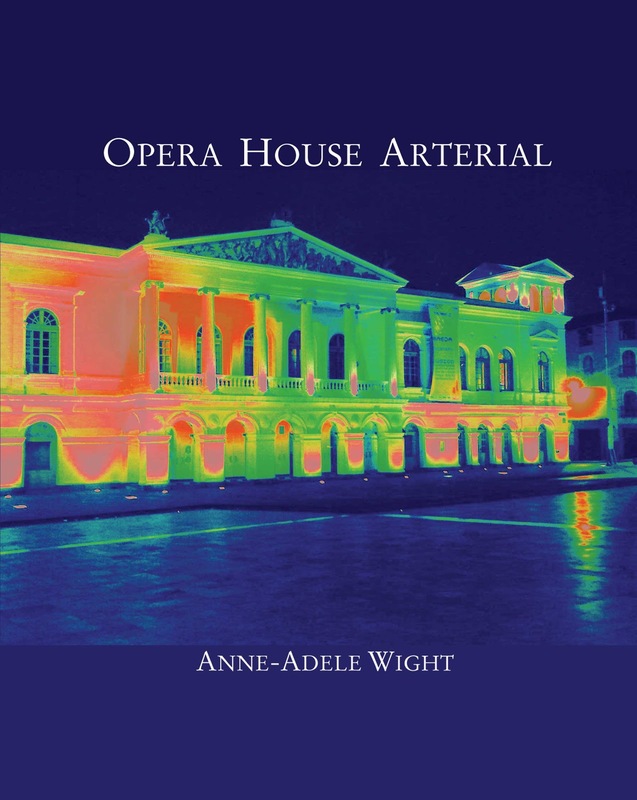 Poet Anne-Adele Wight just released her chapbook, Opera House Arterial, a poem cycle telling a series of stories about the life and adventures of an opera house. Knowing that her first book, Sidestep Catapult, is a collection of richly textured but separate poems, I asked Anne-Adele to talk about how and why she produced this new work as an almost-narrative set. Opera House Arterial (BlazeVOX, 2013) is a mythology in 56 poems. The focus is a trickster spirit in the form of an independently mobile opera house. It chooses different modes of travel: flying, swimming, crashing through trees, manifesting in a couple’s bed. When weary of traveling it hangs out under a bridge and gnaws bones. This entity is up to no good, so beware. When Opera House first showed up it didn’t feel like a narrative. In 1983, a friend showed me a postcard she’d received from Ecuador. It showed a view of Teatro Nacional Sucre, the 19th-century opera house in Quito. Buildings in the foreground made the opera house appear to be floating, and the Andes rose high in the background. I responded on a sensory level with the urge to write a poem. The unreal quality of the postcard made me see the opera house as hallucinatory; the poem would revolve around that hallucination. My first thought was that two people would hallucinate the same opera house at the same moment, without communicating and possibly in different places. But how to convey that thought? I couldn’t make the poem stick. So I put my idea in the usual black hole and left it there a long time. In 2011 I finally realized I was dealing with a collection. The insight came during a surreally long afternoon at a racetrack, where I’d gone under duress and was bored to extremes. I pulled out the notebook I always carry, and suddenly the opera house was staring me in the face. I began to scribble notes––not poems, but their raw material, the poetic ore. I took them home, let them process themselves for a while, and the book took off. I let the notes sit for about three months while I published another collection and lived my usual life. One day I pulled them out and started writing. The first completed opera house poem opened the way for another and then another. Sometimes the poem would overtake me and I’d write a draft or fragment in my notebook. Sometimes I’d sit down at my desk with no particular idea, pull out my notes if I had any, and start typing. Opera House gestated for about nine months, a perverse mythical infant. Most of the book isn’t a linear narrative; each poem tells a small, discrete story. However, the last six poems link together to show the opera house kicking off an apocalypse––all in fun, of course. The writing process was so delightful that finishing left me with mixed feelings. As soon as BlazeVOX accepted Opera House I started wondering about the next book. Could I do it the same way? Could I do it at all? I tell myself I can do it again. The process will be different. This part is an act of faith: believing there’s more in my head than is apparent from a surface perspective. I have no encompassing vision so far, only poetic fragments and a folder of pictures I’ve downloaded that intrigue me for some reason. Lots of odd colors, lots of sky. I’m not sure where the pictures fit in, but I do know they have a place in whatever happens next. Whatever it may be. 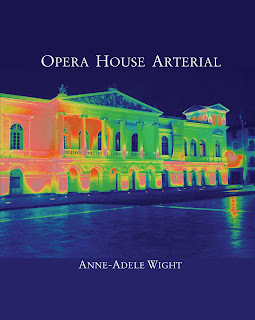 You can purchase Opera House Arterial directly from BlazeVOX or on Amazon.